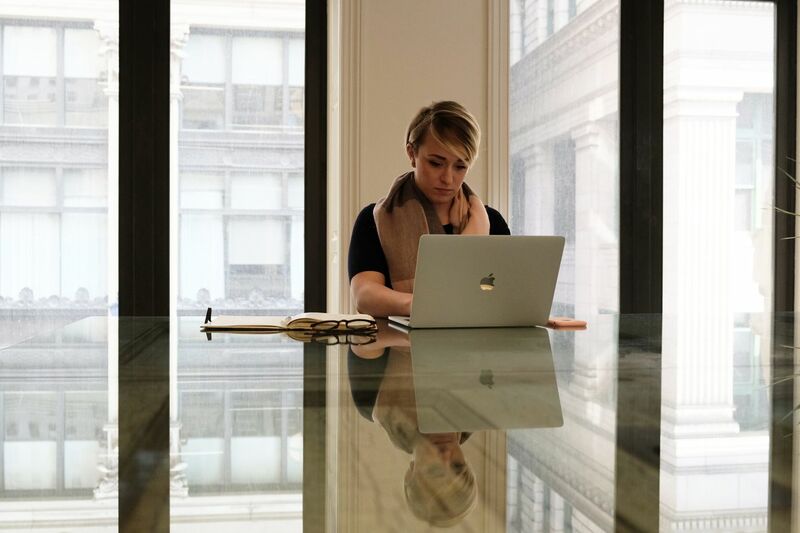 Jayna Fey, a marketing and branding consultant, works on her laptop at Spaces - Philadelphia, a coworking space in the Hale Building in Center City Philadelphia. Not anymore. The 30-year-old consultant says she’s done making cracks about who she is: a pixie-cut-rocking, septum-ring-wearing leader with a brash sense of humor. Today is Equal Pay Day. Here’s what policymakers are doing (and not doing) to fix the wage gap. But that doesn’t mean Fey, of Point Breeze — who’s also managed restaurants and dabbled in standup comedy — is done being funny at work. There are too many benefits. What’s consistent is that good things can happen for women who use humor at work, like sprinkling a presentation with puns to make others comfortable or easing tension with a sarcastic one-liner. Jonathan Evans, the study author and a doctoral student in management at the University of Arizona, said that while the results suggest women can’t benefit from using humor in the same way their male colleagues do, the goal wasn’t to tell women to tone it down. Instead, people should use the report to recognize the prejudice. Researchers had two actors, a man and a woman, deliver presentations as if they were managers of a retail store. Both presented two reports, one funny and one not. The researchers avoided humor that could be risky for women — no sardonic jabs, no making fun. They opted for conversational wit that was more light and self-critical. More than 300 participants watched their presentations, rating whether they found the boss “functional” or “disruptive.” When the male actor was funny, he was rated as more functional. When the female actor was funny, she was rated as more disruptive. But plenty of funny women haven’t seen their careers play out that way. Mina Llona, aka radio host Mina SayWhat on Sirius XM’s The Heat and Boom 103.9, is sure that humor helped her as a Latina working in urban radio. Radio personality Mina SayWhat says humor has helped her working in urban radio. “But normally, I don’t think people respond to my sarcasm as well as he did,” she said. Some of her peers in the nonprofit world, she explained, have read her as aggressive and sassy. If she wasn’t a black woman, she doesn’t think that would happen. She’s been thinking about her sense of humor recently, talking about it in therapy. A 2000 study in the Journal of Managerial Psychology noted that women and people of color across genders in the workplace were historically discouraged in professional development guides to avoid humor altogether. But in diverse settings, people might be using jokes as a means to cope. Evans said that while they didn’t evaluate how race would shift reactions, that merits further study. Brittnie Knight, shown outside near her Center City Philadelphia office, uses sarcasm to navigate tough topics in the workplace. Cecily Cooper, an associate professor of management at the University of Miami who’s researched humor in workplaces, said those differences can even cause anxiety during conversations that should be fun. She added that the study says more about gender than humor. Since the experiment captured only first impressions, the study’s authors acknowledge that other factors could offset a poor reception to jokes. For example, the researchers wrote in the Harvard Business Review, a funny woman boss with “a reputation for arriving early, staying late” could skip the costs that other women pay for trying to get laughs. SayWhat said there are pluses to using humor as a woman in radio — using it makes you more likable and brings levity to news or commentary. Still, she’s noticed women can’t seem to use sexual humor the way men can, without risking the consequences or being oversexualized. When she’s discussing R-rated topics on her show, she’s careful about not going too far.